The flanker has apologised for his actions. Hardie will be available for to play again in January. EDINBURGH AND SCOTLAND flanker John Hardie has been handed a three-month suspension for gross misconduct following an internal investigation amid reports of alleged cocaine use. The forward will be unable to play until mid-January, with the suspension backdated to his initial ban, which started in October. The Scotland international, 29, was expected to be a part of Gregor Townsend’s squad for the autumn internationals but was forced to miss out following the incident and confirmation of his ban makes it unlikely that he will start next year’s Six Nations. “I would like to apologise to everyone for putting myself in this situation,” said Hardie. 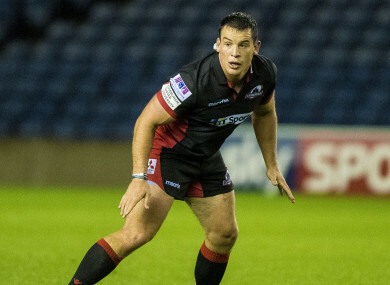 “John has cooperated with the disciplinary process throughout,” said an Edinburgh statement. “He has acknowledged the serious mistake he has made as a professional athlete and has accepted full responsibility for his conduct. It has been made clear that we are not prepared to tolerate the behaviour which caused this situation. Email “Scotland's John Hardie handed three-month suspension for 'gross misconduct'”. Feedback on “Scotland's John Hardie handed three-month suspension for 'gross misconduct'”.